While power banks are one of the tools that smartphone power users consider to be standard equipment, some consumers don't like to have the accessory weighing down their pockets, or holding it in their hands along with their phones; a power bank takes up space that might be put to better use. Instead, you might want to consider a Mophie Juice Pack. These are cases for certain smartphone models that come with a second battery inside. 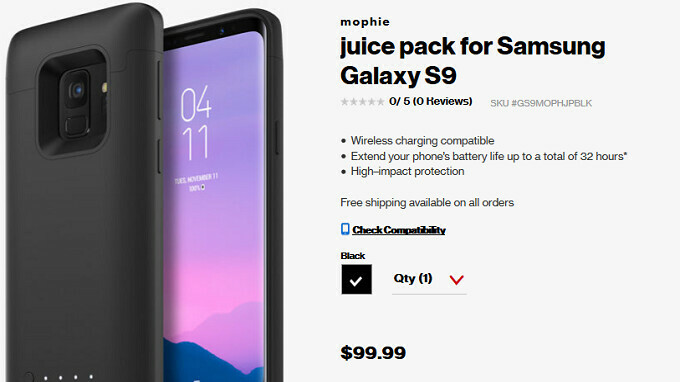 Now, for a limited time, Verizon has a sale on Mophie Juice Pack cases that can save you up to 74% off the regular price. Keep in mind that the battery inside the case might be no larger than 2750-3950mAh compared to the 10000mAh power banks that have dropped sharply in price over the last year. Still, if you just need to extend your usage for 12 hours to 24 hours, the Mophie Juice Pack case is the lightweight answer. And you don't have to hold or put in your pocket anything other than your phone. Mophie also announced today a new product line called Charge Stream that offers two distinct products. The Charge Stream travel kit allows you to wirelessly charge any device that supports the Qi wireless charging platform. It includes a 2.4A wall adapter, 2.4A car adapter, a 1.5m (4.9 ft) USB-A to micro-USB cable and a travel pouch for $49.95. And the Charge Stream Pad Mini plugs into a wall outlet to provide 5W of wireless charging power to Qi enabled devices. This product is priced at $24.95. Running through this list, you'll notice that there are several versions available for the iPhone 6 and iPhone 6s ranging from a case with a 2750mAh cell, to one carrying a large 3950mAh battery. If interested in any of these Mophie Juice Pack cases, click on the sourcelink below.